During an upgrade of the Hume Highway the consortium tasked for the design and construction of this project encountered a number of environmentally sensitive areas through which clean water open drains had to be constructed. The original design called for traditional concrete drains and rock beaching. This proved difficult to construct, very expensive and posed potential problems to the local ecology. In conjunction with our Global Synthetics Technical Design team, the contractor decided that a number of such concerned areas lining the Highway would be selected to be replaced with engineered vegetated alternatives using Turf Reinforcement Matting (TRM) technology. The contractor selected Pyramat® 25 supplied by Global Synthetics. Why was Pyramat® 25 selected? The properties of this product made it well suited to this application. It has a three-dimensional matrix with no loose fibres (See Figure 2) and is made using UV stabilised polypropylene. The three-dimensional structure increases the surface area by 40%, thus reducing water velocities. A fully vegetated TRM drain can resist velocities of up to 7.6 m/sec. A partially vegetated TRM drain can resist velocities of up to 6.1 m/sec, and an un-vegetated TRM drain can resist velocities of up to 4.6 m/sec. TRMs promote revegetation within the drain by slowing water velocities and trapping sediment. After the area is vegetated the mat then provides a stable and durable reinforcement for the roots of the vegetation. As TRMs are synthetic, they don’t break down over time, thus continuing to stabilise the drain, and ultimately reinforcing the vegetation, for up to 50 years or more. 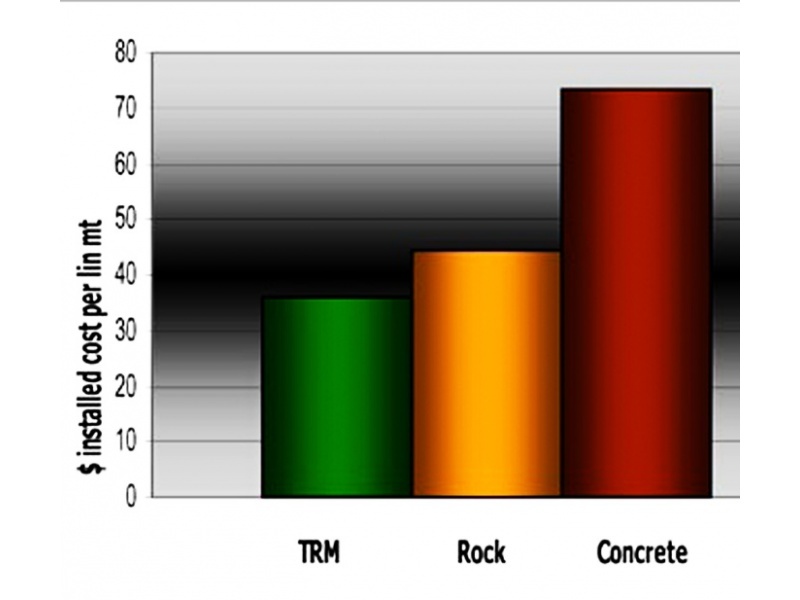 According to the contractors costings and budgets, the Pyramat® 25 solution was less than half the price of the specified previously proposed concrete method and 25% cheaper than alternative rock-armour (see Figure 1). Installing TRMs is quick and easy – similar to that of any roll out erosion product. The mat was keyed in where the water will entered the drain to avoid water undermining the mat, pinned at consistent intervals and overlapped in a downstream direction. The TRM was easily cut with a pair of scissors, therefore, installed wherever it was needed, in whatever shape was necessary. For example the TRM was easily cut to fit around the headwalls of pipes and culverts, which negated the need for rock beaching at these locations.